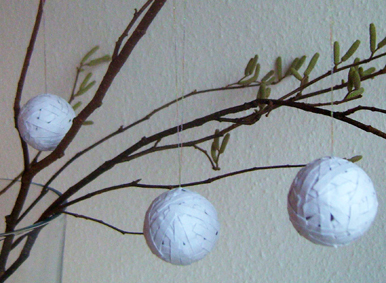 As winter seams to want to disguise as a very rainy spring, with temperatures so high that snow is no option in the near future, I decided to make some snowballs and hang them on branches. This is a job for people who love making a bit of a mess and are not afraid of sticky fingers. Shred the paper in a paper shredder that does cross-cuts. Dilute the glue with water to the consistency of condensed milk. Spread a little bit of glue onto the plastic ball. Fold the thread in half and glue first. 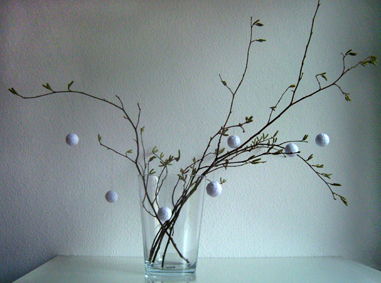 Fix it by glueing a few paper cuts crosswise over the first centimeter. Cover the whole ball with paper cuts, making sure to thoroughly spread the glue so that the cuts stick properly (This is the messy part!). Continue until the ball is covered completely. It does not matter if there are small gaps left as you can see on the photo. This single sheet of paper sufficed to do 7 balls.